This past weekend, I worked at a conference that featured a bookstore with tons of resources. 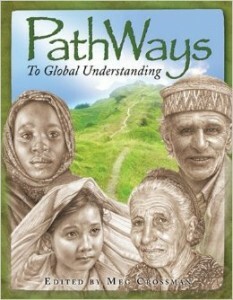 One of those was Meg Crossman’s “Pathways to Global Understanding.” In it, she details the Biblical, Historical, Strategic, and Cultural dimensions of God’s plan for the nations.” Her basic approach is to include articles from various authors, then pull them together in such a way that the reader can walk away with a fuller understanding of God’s heart. The illustrations and artwork are beautiful. The maps and charts help make it very compelling. It has a bunch of Case Studies in the back of the 500-page handbook. If you’ve taken the full “Pathway” course, would you share your take on it by clicking “Comment” following the web version of this item? Thanks in advance for sharing your thoughts. Why haven’t I heard of this course before? Question #1: Is it good? Question #2: Does it motivate participants? Question #3: Would you recommend it? Please use the Comment box below this item as it’s posted on the web. Just click on “Comment” below to jot down your answers please. Recognized by TIME magazine in 2004 as one of America’s 25 most influential evangelicals, Ralph D. Winter, a world-renowned scholar of Christian mission and the founder and creative activist in a wide range of mission initiatives, has died. He was 84. Winter died Wednesday, May 20 at his home in Pasadena after a seven-year battle with multiple myeloma and after additional struggles with lymphoma since early February. 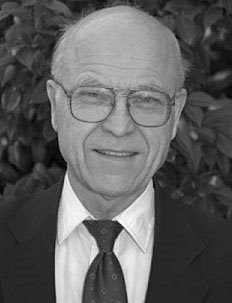 Many of the accomplishments of Ralph Winter’s long career as a missionary, mission professor and “mission engineer” stemmed from his conviction that Christian organizations accomplish more when they cooperate in strategic ways. It was at the Lausanne International Congress on World Evangelization in 1974 that Winter burst upon the world stage with innovative analysis and advocacy that have redirected evangelical mission energies ever since. Born in 1924, Winter spent his boyhood years in South Pasadena and was nurtured in Christian faith by devout parents and membership at Lake Avenue Congregational Church in Pasadena. He pursued a degree in civil engineering at Caltech, an M.A. at Columbia University in teaching English as a second language, and a Ph.D. at Cornell University in structural linguistics, with a minor in cultural anthropology and mathematical statistics. While in seminary at Princeton, he served as a pastor of a rural New Jersey church. He married Roberta Helm in 1951 while studying for his Ph.D. at Cornell. Roberta’s expert help in research, writing and editing, among many other gifts, made her a valuable partner to her husband from the time of his doctoral studies onward. Ordained in 1956, Winter and his wife joined the Presbyterian Board of Foreign Missions. They worked for ten years in Guatemala among the native Mayan people. 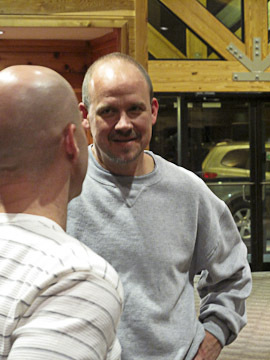 Along with the development of 17 small businesses for bivocational pastoral students, Winter joined others to begin an innovative, non-residential approach to theological studies known as Theological Education by Extension (TEE), which has since been reproduced in countless mission contexts around the world. Winter’s creativity with TEE and other initiatives caught the attention of Donald McGavran, who in 1966 invited Winter to join the faculty of the new School of World Mission at Fuller Theological Seminary (Pasadena, CA). Between 1966 and 1976 Winter taught more than a thousand missionaries, but he also claimed to learn much from his students. During these years he founded the William Carey Library, a specialized publisher and distributor of mission materials. He also co-founded the American Society of Missiology, helped in starting Advancing Churches in Mission Commitment (ACMC), and inaugurated what is now the Perspectives Study Program (first called the Summer Institute of International Studies). Building on McGavran’s emphasis on people groups, and gleaning insights from his interaction with students and faculty, in July 1974 Winter presented a seminal address at Lausanne, Switzerland to the International Congress on World Evangelization, underscoring the necessity of pioneer, cross-cultural missionary outreach to thousands of “hidden peoples”, later more commonly known as “unreached peoples”. Winter’s statistics and careful reasoning stunned an audience (and their constituencies) that had previously assumed that “near-neighbor evangelism” by existing churches would be sufficient in world evangelization. To facilitate creative outreach to unreached peoples, in 1976 Ralph and Roberta Winter founded the U.S. Center for World Mission (USCWM), and in 1977 the related William Carey International University, on the former campus of Pasadena Nazarene College, mobilizing evangelicals to pay for the acquisition of the $15 million campus through a series of campaigns that culminated in 1988 and that emphasized mission vision more than fund-raising. A community of workers in Pasadena and other locations, now known as the Frontier Mission Fellowship (FMF), has developed to sustain an array of cooperative mission projects, and until two weeks before his death Winter served as General Director of the FMF. Winter is preceded in death by his parents, Hugo H. Winter (a civil engineer recognized as “Mr. Freeway” for his leadership in the development of the Los Angeles freeway system) and Hazel Patterson Winter, and by his first wife of nearly 50 years, Roberta Helm Winter. He is survived by his second wife, Barbara; by his and Roberta’s four daughters (all of whom are active in Christian mission), Elizabeth Gill (Brad), Rebecca Lewis (Tim), Linda Dorr (Darrell), and Patricia Johnson (Todd); and by 14 grandchildren and one great-granddaughter. He is also survived by his older brother, Paul H. Winter (Betty), a graduate of Caltech and a well-respected structural engineer; by his younger brother, David K. Winter (Helene), president of Westmont College in Santa Barbara for more than 25 years; and by nephews, nieces, and numerous friends and colleagues worldwide. We *regularly* run into cross-cultural like-minded workers who got their start in Perspectives classes. I’ll be teaching in 3 different courses this spring. Hope to see you there. possible place within it? Tony would like to know. If so, just click on “Comment” below. WANT TO LEARN MORE ABOUT PERSPECTIVES? ARE YOU CATCHING THE GREAT DIALOGUE ON THE BRIGADA BRIGADE? WE’RE THANKFUL! GOD BE PRAISED! WOULD YOU BE ONE OF THE 76 PARTNERS STILL NEEDED IN 2007? for the latest input on topics and questions such as polygamy, how to determine one’s calling, civil disobedience, moral behavior resources, and more! There have been some excellent pieces there. It’s truly a tribute to the high caliber of readership we have for Brigada Today. Thanks for participating! Lloyd says one can set up multiple accounts, and that the offending spam can be viewed on the web. Good find, Lloyd! Martin mused, “I don’t yet fully understand the intentions of Beijing or the leaders of this work. I await guidance and pray a lot.” Let’s join him. NEW BOOK UNWRAPS LATIN AMERICA — “From Rio to the Rio Grande: Challenges and Opportunities in Latin America,” is a book by Kenneth D. MacHarg. It’s $16.25 and is available by calling toll free 1(800)247- 6553 in the USA or from Amazon.com as well as through local bookstores. Readers tell us that it does a good job at revealing the way Latins tick. $50 from a brother in Tulsa, OK, helping launch the Network of Azerbaijani Partnerships. This is a network of partnerships in several countries that work among and advocate for the 40 million unreached Azerbaijani people predominately in Azerbaijan, Iran, and Iraq, but also in smaller numbers in other countries in Central Asia, plus the UK and the US. Please take a moment right now to lift up the Azerbaijani people and this consortium of partnerships. Give praise that they’re hooking up and ask God to bless those who are trying to pull them all together. $216 from a worker in StoryRunners, a ministry of Campus Crusade for Christ using oral methods to reach Unreached People Groups. They wrote, “Thanks so much for your ongoing ministry to the missions community! I read your Brigada regularly and have benefited from it greatly! May the Lord meet ALL your needs and keep the Brigada flame bright!” Please pause tonight to lift up this innovative form of gospel outreach. $25 from a family headed soon to Zambia. They wrote, “I’ve been a Sr. pastor for the last 13 years here in Illinois; my wife and I are departing on Jan 10 to serve with Action International Ministries in Lusaka, Zambia. I will be involved in pastoral leadership development and my wife will be involved with pastor’s wives and children’s ministries. If the Lord would keep us in good health we hope to spend the next ten years serving the church in Africa. We are both 56. Your weekly email has proved helpful on several occasions as we have been preparing for missions. In fact, it is the only subscription email that I am keeping as we make the move. Thank you for your service to us.” Whoa. Sobering and encouraging. Please lift them up tonight. We’re so thankful for these dear friends and partners. Thank you Lord! Click on “Resources” then “Donate” and follow the instructions. Be sure to note that the gift is for Brigada. THE BACKPAGE: THE STORY OF LETUNIN AND NGOTO — Yesterday we received this note from Dorothea, who served in East Africa. She wrote, “We had to fix lots of flat tires in the desert. On one such stop we came upon an extraordinary Samburu couple, Letunin and Ngoto. While my husband Jim changed the tire and our three children played in the sand, Letunin told us this of his life story. 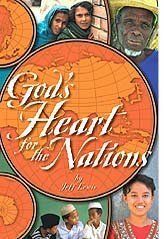 Letunin and Ngoto lived far out in a desert village and understood only a few portions of Scripture that had been translated into a related language. They had become followers of Christ and were extremely happy to be married to another person who shared deep faith in Christ. Among other life lessons, they had learned of the Apostle Paul’s instructions on marriage in I Corinthians 7, telling each man and woman to have his/her own husband. (“Let each man have his own wife, and let each woman have her own husband.”) So, as a young married couple they had vowed to follow God’s Word in this area. Letunin would not take a second wife, though most of his friends had multiple wives as soon as they could afford to feed them. The village people regularly laughed at this long-married couple and reminded them that because Ngoto was barren she was obviously cursed by God. It seemed obvious that Letunin should take a second wife. The women told Ngoto, “If you really loved your husband you would INSIST he take a second wife so you will have someone to take care of your camels and goats when both of you are old.” Ngoto always replied that God had the power to give them a child. The women laughed out loud at Ngoto’s non- traditional notions. The elders called Letunan foolish and kept urging him to take a second wife. They called Ngoto “useless.” But Letunan always answered from God’s Word, saying that each man should have his own wife (singular) and each woman her own husband (singular). The couple became the laughingstock of the entire village and amongst the larger people group. They named the child the Samburu word for “Laughter.” It reminded them of all the years people had laughed at them, and of their belief in God’s Word. It also reminded them of the joyous laughter God brought into their lives that day. If you ever get the opportunity to visit this small East African village, you will find a growing Samburu church, with many Christians trying to obey what they understand of God’s Word. Many began following Christ because of Letunan and Ngoto. God used this one couple and their adherence to His Word to start a God-honoring group of Christ-followers out in the desert. Letunan and Ngoto stand as examples to me and to you. Follow God’s Word against all odds. He always has the power to turn situations around to bring glory to Himself. Hats off to Dorothea for sharing this very poignant example of how difficult it is to implement life-change when gospel confronts culture. Her comments gave me further pause not only on the question of polygamy and how to handle the gospel impacting a culture. But her note also reminded me of the collective experience of the entire Brigada family. I’m so thankful for all the people who make up our collective consciousness and I give thanks to Go for the group-think that can occur when we process these questions together. PERSPECTIVES COURSES POPPING UP EVERYWHERE, LIKE JAX! MAKING PROGRESS; CAN YOU PUT US OVER THE TOP? THE BACKPAGE: WHAT’S YOUR PHILOSOPHY ON BORROWING? MICROFINANCE AND MICROENTERPRISE DEVELOPMENT — For those ministering to the poor in the Two-Thirds World, the Chalmers Center offers a series of three distance courses on conducting Christian microfinance and microenterprise. The initial course is called “Foundations and Principles of Holistic Ministry” (Two-Thirds World section). The “Foundations” course helps you understand appropriate goals and strategies for conducting Christian economic development in poor communities within the Two-Thirds World. The course will actually benefit anyone preparing for Christian outreach and ministry among the poor, whether they plan to implement an economic development strategy or not. This course will be offered on Feb. 4 – 29, 2008 and again on April 28 – May 23, 2008. Cost of this four-week course is $75 (USD) plus the cost of separately ordered course material. Additional courses are available as follow-ups. IN SEARCH OF A LATINO ETHNOMUSICOLOGIST — Brigada sometimes helps search for those “needle-in-a-haystack” personnel needs. Here’s one: A Christian worker is search for a Latino ethnomusicologist. (If you don’t know what that is, no need to reply. :-) ) If you *do* know… or that is, if you have a lead, please ask the cross-cultural musical teacher to drop an email to: danieljohnson(at) iibet(dot)org [As a means of preventing spam for our contributors, in the preceding email address(es), please replace (at) with @ and (dot) with . and reassemble the email address on one line.] Dan thanks you in advance! Dave will appreciate it. And thanks for using Brigada! $45 from Bridge Builder Ministries Int’l ! Thanks Doug! $20 from a Brigada participant who started back in 1995!!! $100 from a participant in Ukraine! Thank you! $300 from WorldconneX Mission Network, www.worldconnex.org . Whoa. $350 from Hebron Missionary Advocacy Fellowship http://road2hebron.jesusanswerscom Please visit their site. Thank you so much for your ministry! We’re sooooooooooooooooooooooo grateful to these partners! May God bless them in ways beyond belief! MAKING PROGRESS; CAN YOU PUT US OVER THE TOP? — Whoa. In the last Brigada Today, we reported that we were hovering at $6,752.87 toward our 2007 budget needs of $17,150. Suddenly, we’re within reach! We now have $8,452.77. Just think… if your church or group, or if you as an individual were to have *any* contingency tithe money left… Would you consider investing in something that is mobilizing and resourcing for the unreached… since 1995? If you have ever found something in Brigada to by helpful… or if you’d like to underwrite Brigada for someone who lives in a faraway land who cannot send funds on his or her own, please just click on the “Donate” page.